Do you have innovative fundraising ideas? Do you need fundraising experience? The Fund Development Committee needs you! Stop by our monthly meeting. The meeting takes place in the library on the first floor. Please use the door on 14 St for entry. The Membership Services Committee needs YOU! Join our committee meeting to share your ideas or learn some new skills in membership recruitment and retention! Please use 14th St entrance. Leadership skills are important to attaining any goal. Join Thursday Network for our April GBM and workshop on understanding leadership essentials in your personal and professional lives. The Thursday Network Food Pantry supports the health needs of our community members each month. Help us expand our reach beyond the walls of the Greater Washington Urban League by donating items*, funds, or your time to ensure our selected community members have a variety of food and household items to support their basic needs. Sips with Sis is back! After a great Join Week debut, Sips with Sis: An Open Women’s Forum is back for another edition on Tuesday, April 30 at Sudhouse DC. Women of TN are invited to come together to sip and spill tea as we discuss health and wellness, social justice, dating and relationships, and more. This is an opportunity for women to build with each while having an open dialogue, gaining insight from other young professionals. Due to high demand this event will be open to TN members only. Space is limited so register today! Interested in developing general body programs at Thursday Network? Meet us every first Tuesday for our Personal and Professional Development committee meeting. Enter via the 14th St door. Ready to take the next step in your journey as a young professional? 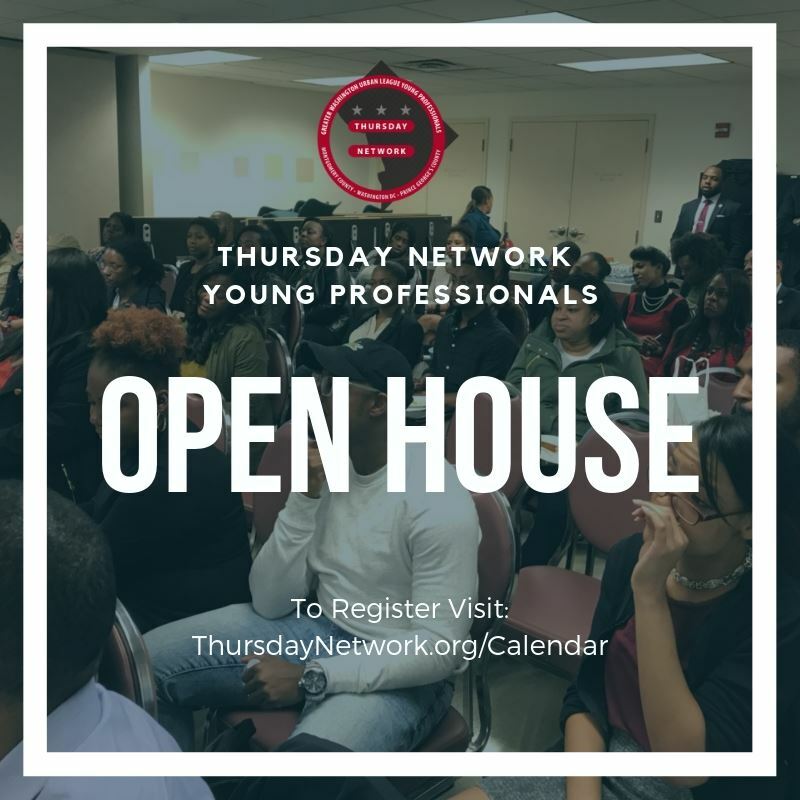 Join Thursday Network for our Open House at 7 PM at the Greater Washington Urban League Headquarters (2901 14th St. NW DC). The Open House will take place in the Pepco Room. Please enter through the ground floor door located on Harvard Street. This session will educate you about Thursday Network and its various committees, the Greater Washington Urban League, the National Urban League Movement, and explain how you can serve as an active chapter member. *Everyone interested in learning more about Thursday Network and what we do. For more information please reach out to Membership Chair Natasha Johnstone at membership@thursdaynetwork.org. y Network bylaws and other governing documents, and proposes needed changes in these documents to better facilitate operations and activities. The committee also reviews all submitted amendments for compatibility with the bylaws and prepares proposed changes for circulation. If you are interested in organizational structure and operations, this committee is right for you. Join us! Please enter using the 14th St entrance. Contact parliamentarian@thursdaynetwork.org with any additional questions! Come share your skills or learn something new at our joint PR and Digital Media Committee meeting! The meeting will take place in the library on the first floor. Please enter through the door at the top of the stairs on the 14th St. The Civic Engagement Committee meeting meets every third Monday. Bring your passion and your ideas on how we can better help our community! Meetings will be held in the library. Please use the door on 14th St for entry. Are you looking for ways to give back to your community? The Community Service Committee needs you! Join our committee meeting as we brainstorm ways to shape our community! The meeting takes place in the first floor library. Use the entrance on 14th St for entry. Welcome to all the new Thursday Network members! We welcome you to a day dedicated to membership development and professional growth! The purpose of this orientation is to build the next cohort of dynamic volunteers and develop a strong leadership pipeline. This orientation will provide you with the opportunity to learn about TN and NUL, as well as find your niche within the organization and eventually become an active Thursday Network member. Orientation is REQUIRED for all new members. This orientation is also for returning members who have not attended an orientation. Light snacks will be served and RSVP is required. 02/28/2019 February GBM: Does Black Love Still Exist..?